It's not just income inequality. It's lifespan inequality. And education inequality. And declining economic growth. It's a well-established fact that the rich are getting richer, while the poor and middle class are falling behind. "The 400 richest people in the United States have more wealth than the bottom 150 million put together," said Berkeley Professor and former Labor Secretary Robert Reich on a recent CNNMoney panel on inequality. Meanwhile, the median wage earner in America took home 9% less last year than in 1999. But the rising income gap is manifesting itself in American society in other ways too. Social scientists have long said income inequality is bad for society. Yet popular measures of social stability -- crime rates, voter non-participation -- have been going down over the last couple of decades. So how does inequality hurt? Lifespans: Paychecks aren't the only things that are increasingly unequal. 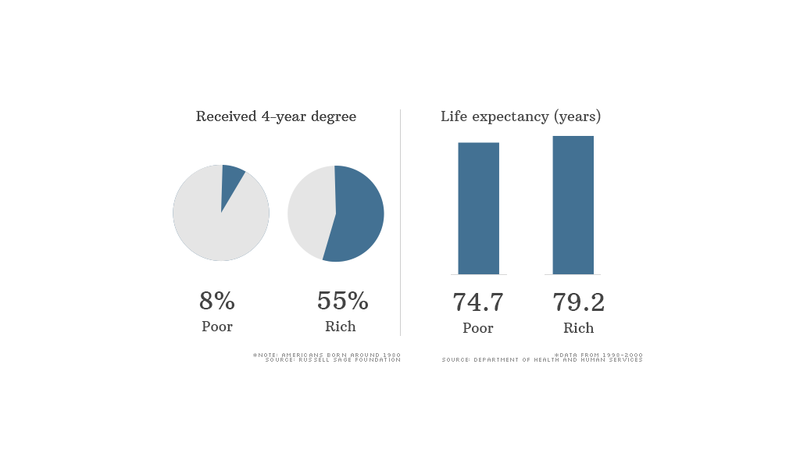 Rich people are actually living longer than poor people. In the early 1980s, wealthy Americans lived 2.8 years longer than the poor, according to the Department of Health and Human Services. The wealthy and poor were defined as the top and bottom 10% on a number of different economic measures. But by the late 1990s the rich were living 4.5 years longer, and the gap has only widened since then, HHS said. The increasing disparity is a result of a variety of reasons including "material and social living conditions" as well as access to medical care, according to HHS. Education: For Americans born in the early 1960s, 5% of poor people went to college and 35% of rich folks did, according to the Russell Sage Foundation. They defined rich and poor as top and bottom 25% for income. Only one generation later -- Americans born around 1980 -- the number of rich people going to college jumped by 20 percentage points. 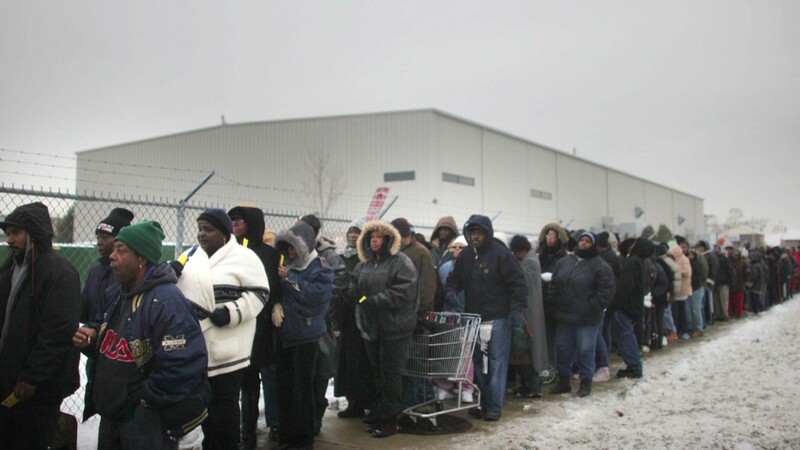 For poor people, it rose only 3 percentage points. That further perpetuates the cycle of income inequality, as an increasing number of middle-class jobs favor the more educated. While researchers stress that it's difficult to concretely link any of these measures with rising income inequality, the correlation is compelling. "When income inequality goes up, you see more inequality in these other things," said Lane Kenworthy, a professor of sociology and political science at the University of Arizona. Related: 5 years after the crisis: Main St. vs. Wall St.
Economic growth: Some economists have long argued that a widening income gap suppresses economic growth and job creation, and may be one reason this economic recovery doesn't feel like a recovery at all. The theory is based on research showing middle-class people tend to spend more of their income than rich people. As their incomes and feelings of relative wealth decline, so does overall economic growth. Since the recession ended, growth has averaged just 2.2%. That compares to the 3.3% historical average since the Great Depression. "Our middle class is too weak to support the consumer spending that has historically driven our economic growth," Nobel Prize-winning Economist and Columbia Professor Joseph Stiglitz wrote in an editorial earlier this year. "With inequality at its highest level since before the Depression, a robust recovery will be difficult in the short term, and the American dream — a good life in exchange for hard work — is slowly dying." Who's to blame for income inequality? What to do about it: Research shows Americans want the country to be more equal -- two thirds say inequality is a problem according to Leslie McCall, a sociology and political science professor at Northwestern University. The trouble is, Americans don't really know what to do about it. Strengthening unions, taxing the rich, raising the minimum wage and better job training are a few ideas. But many view inequality as an unavoidable symptom of the free market -- a market that has, on a global scale, lifted hundreds of millions of people out of poverty and provided the wherewithal to boost living standards around the world. "It's not clear that raising taxes will produce what people want -- which is better jobs and more pay," said McCall.